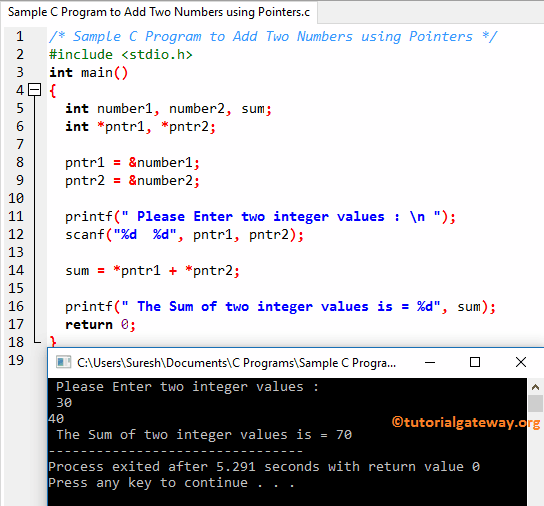 In this article we will show you, How to write a Sample C Program to Add Two Numbers using Pointers and print the output. I suggest you to refer Pointers Introduction to understand the basics about pointers. This C program let the user to enter two integer values, and then we are going add those two numbers using the pointers concept. Later we will assign the total to variable sum. First we declared three integer values called as number1, number2 and sum. And then we declared two pointer variables of type integer. Next we are assigning the address of the number1, number2 to pointers pntr1, pntr2. Following statements ask the user to enter two integer numbers, next scanf statement will assign the user entered values to already declared pointer variables pntr1, pntr2. Here, pntr1, pntr2 are the address location of number1 and number2. Next line, we used Arithmetic Operators + to add the integer values, and then assigned that total to sum. Following printf statement will print the sum variable as output (22 + 44 = 66).